Liverpool Loss? Redknapp hails 'amazing' £18m international; claims he's the Prem's 'best'. Agree? Prior to his move to the Premier League, Liverpool were heavily linked with a move for allegedly 'amazing' Spurs star Toby Alderweireld, who has been integral to Spurs' good form over the last three months. The London club is unbeaten in the league since the opening day of the season, and according to ex-Red Jamie Redknapp, Alderweireld is one of the main reasons for that. "Alderweireld [is the] best defender in the league this season. Jan Vertonghen has benefited from playing with him". Liverpool certainly had a hard time breaching Spurs' defence in Jurgen Klopp's first game, but is Alderweireld really the 'best defender in the league'? This is a prime example of where individual perception is shown to be grossly inaccurate by objective facts. Like every football fan, Redknapp is entitled to his opinion about players, and his view (like every opinion) has a lot of value. However, the statement that Alderweireld is the 'best defender in the league' just isn't accurate. To prove this, I'll simply post a comparison with Martin Skrtel, who is Liverpool's most effective defender this season. As you can see, when it comes to *individual* effectiveness, Skrtel exceeds Alderweireld in 16 different areas, including all the defensive areas that constitute a central defender's primary role. 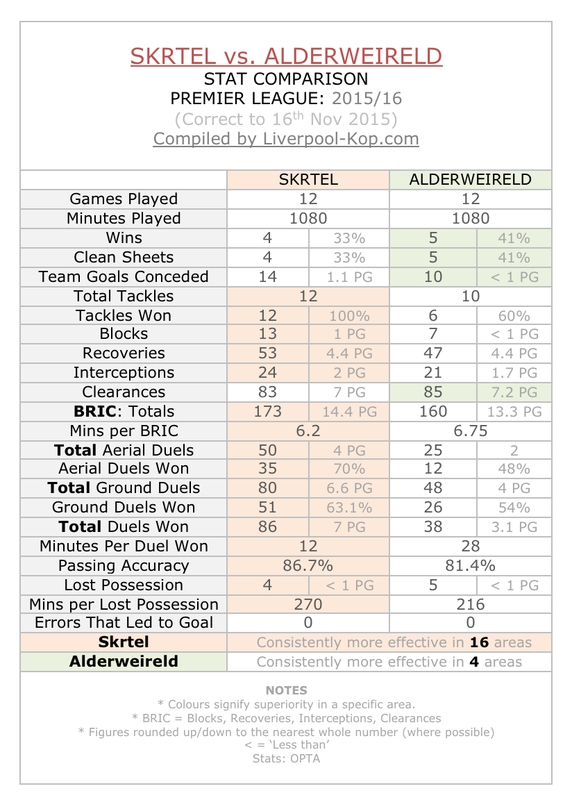 With this in mind, how can Alderweireld be the 'best defender in the league' when Skrtel outperforms him in almost every defensive department?